Join FOA, one of Denmark’s largest workers unions, for 25 Danish kroner a month. The au pair scheme is officially a cultural exchange programme but over the last years it is FOA’s experience that some families consider the au pair scheme as a way of getting cheap labour and sometimes forget to respect the regulations in the au pair scheme. • Payment of e.g. plane ticket. What does FOA offer Au Pairs? • Invitations to skills training events. Join as a member by calling 8020 2030. Calling is free of charge. If you are experiencing problems in relation to your stay as an au pair in Denmark we also have a hotline: +45 46973880. See also FOA Au pair Group at Facebook. 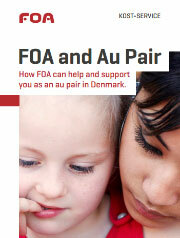 Download the folder "FOA and au pair - how FOA can help and support you as an au pair in Denmark". Here you can read more about what FOA has to offer and also the history of FOA. FOA and KIT (Church Integration Ministry) have in cooperation launched a website that offers information services, network opportunities, counseling, emergency service in crises and nonprofit mediation. FOA and KIT are working together in relation to information services, network opportunities, counseling, emergency service in crises and nonprofit mediation for au pairs and host families.